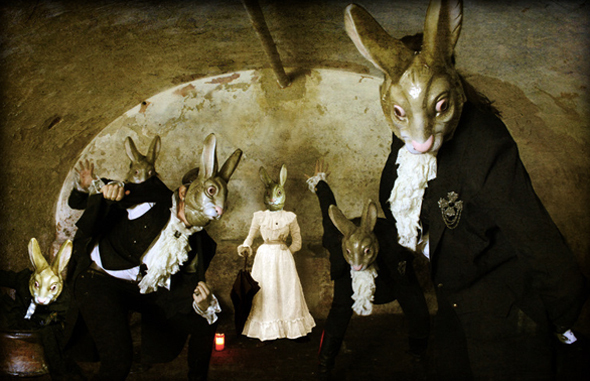 Ksenia Anske/Blog/EASTER BUNNY APOCALYPSE. Chapter 9. EASTER BUNNY APOCALYPSE. Chapter 9. Please welcome our 9th author, Michel Lee King, (aka @Michel_Lee_King). Michel spends her time drinking copious amounts of coffee while writing dark and light fiction and pretending not to be a raging introvert. She also enjoys motorcycle camping, kayaking, beer that tastes like beer, and red and white wine. “Well if I ain't a dead dingo's dingie,” Bruce Donnegan breathed in awe. He strolled through the airport tipping his hat to every sheila he passed. “Enough here to make a wanton wombat call it quits.” His smile widened. Maybe old Chipper hasn't sent me on a bad assignment after all. The mission's details had plagued his mind during his flight to Washington, DC. Children and their mothers all lain about with exploded heads, or frothing at the mouth from poisoned Easter fare. Goddamn jackaroos are at it again. He took a deep breath to center himself. Keep a hold on it, Brucey. Ain't nothing in the details sayin' you have to see any of the cursed devils. Catching sight of his old friend beyond the gate, surrounded by men in black coats and dark sunglasses, he gave a jovial wave. “Hey Chipper! How's your rodent problem?” He threw back his head in laughter when the sheilas near him scattered with looks of disgust and fear. Haha! Gets 'em every time. “Been alright. Nice and quiet in the outback. Who are all these mates?” He made the rounds shaking hands without waiting for the answer. Flailing and jumping, Bruce battled with the invisible enemies swarming him. “They're takin' me down! Someone help!” His shirt tore, his body felt cold. He snapped his head forward and bit the enemy charging his face. A man's scream filled his ears. Something wasn't right. The man was angry and grumbling something. P.S. : This is the 9th Chapter of EASTER BUNNY APOCALYPSE. Here are other Chapters: Chapter 1, Chapter 2, Chapter 3, Chapter 4, Chapter 5, Chapter 6, Chapter 7, and Chapter 8. Oh, it gets only worse! Chapter 10 will be published tomorrow.